CLICK on the Picture to see our MEMBERSHIP FORM! 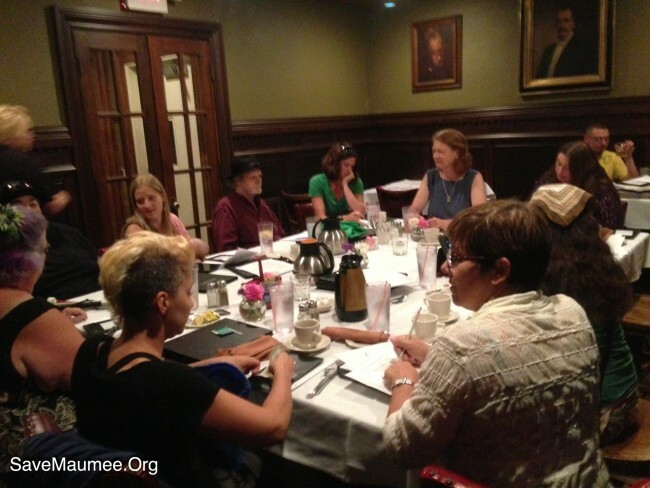 Save Maumee meets the first Monday of EVERY MONTH! 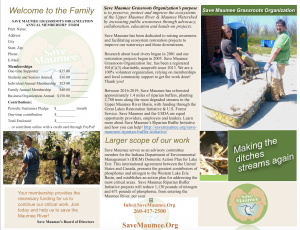 The purpose of Save Maumee Grassroots Organization is to preserve, protect and improve the ecosystems of the Upper Maumee River & Maumee Watershed by increasing public awareness through advocacy, collaboration, education and hands-on projects. All memberships are 100% tax deductible. Your membership will support our work. For 10 years almost all of our funding came from citizens — individuals and families who choose to help us protect water quality, riparian areas, wildlife habitat, recreation, and public health. We pride ourselves on our broad base support of local people and business. Donations of any amount are appreciated. Save Maumee Grassroots Organization Inc. is recognized by the IRS as a 501(c)(3) tax-exempt charitable nonprofit. Your contribution or membership is tax deductible to the fullest extent allowed by law. Please tell us if you would like to provide an in-kind or service donation or become a member today!Thank you so much for your support! We rely heavily on the dedication of our many volunteers. Volunteers founded Save Maumee in 2005; and have been increasingly crucial to our advocacy and education campaigns ever since. Please see the list below and let us know which project(s) you would like to lend a hand. We can also look into customizing a project that best fits your interests and skills. To sign up for a project, create one, or to simply donate much-needed funds, services, or in-kind supplies Please EMAIL the Board of Trustees or call Abigail King at 260.417.2500 or come to our Monday Monthly Meetings! *A note on the Value of Volunteering ~ According to The Independent Sector FOUND HERE: the most recent estimated national dollar value of volunteer time in Indiana was $18.33/hour (2011) and now stands at the recognition amount of $24.14/hour in 2016! We recognize the value and contribution of your time! Volunteers will help us advertise and also get our name, logo, and contact information more visible in the community. Event publicity may also be done via internet. Volunteers will help identify and catalogue Maumee watershed tributary rivers’ amenities such as public access sites, marinas, restaurants, camp grounds, boat ramps, etc. Members will help us to document potential problematic areas in our watershed, and help us to post information on the website as a service to its stakeholders and use the information for outreach. Research will include computer and phone book research as well as research in the field to identify the amenities and to distribute outreach materials at these locations. Volunteers will identify zip codes within the watershed and its tributary watersheds and use them to run searches for National Pollutant Discharge Elimination System permits – permitted discharges of pollution allowed by the Clean Water Act. Searches will be run on several easy-to-use Environmental Protection Agency websites. This research helps us identify current/potential polluters. This project may also include data entry to help us organize information about current/potential polluters. You can sign up for IDEM PUBLIC NOTICES HERE. Volunteers will choose one or more newspaper(s), whether scholastic, small town, or big city, and scan them daily for articles relevant to the Maumee River and its tributaries. (For example, articles about pollution, wildlife habitat, recreation, etc). After finding a relevant article, volunteers will write a personal letter about that article, in support of cleaner, healthier waters and rivers. For some talking points and background information we suggest you review relevant information on the blog. Volunteers will send their letter to the newspaper’s editor for possible publication, following the length and submission directions relayed in each newspaper (or newspaper website). Please address the letter on behalf of yourself as a concerned citizen, not on behalf of Save Maumee unless reviewed by our Board of Trustees. Volunteers will provide lists of the names and addresses of friends/relatives/colleagues they think might be interested in becoming a Save Maumee member, donor or volunteer. We will then contact these potential members. Other ways volunteers can help recruit members is by contacting those friends/relatives/colleagues themselves, or by helping us prepare/mail letters to potential members identified by other volunteers. Other ways to help with New Member Recruiting include Facebook or Twitter outreach and by circulating our brochures at strategic locations.